Rojava – After almost seven years since the war in Syria began, battles between Kurdish-led democratic forces (SDF/YPG/YPJ) and Daesh (IS) have left the Islamic State nearly defeated throughout the region. When Rojava was liberated from direct Syrian government control in summer 2012, this set off a political revolution towards a self-organized democratic society across the northern regions of the country. On March 17th, 2016, 151 delegates from various northern regions of the Syrian state, including Rojava, proclaimed autonomy through the creation of the ‘Federation of Northern Syria–Rojava’. In recent weeks, NATO member state Turkey has attacked the Kurdish-controlled Afrin Canton (and the city named after the region) in an attempt to crush the growing revolution. Meanwhile, to the east, revolutionary forces throughout Rojava continue building an autonomous democratic society. Before years of war devastated northern Syria, decades of capitalist exploitation by the Syrian state created the ecological disaster the people of Rojava face today. Through wheat monoculture, oil extraction, and neglect of waste management planning, the Syrian state has left the region with growing ecological problems. Simultaneously, the Turkish government has been expanding dam projects along rivers running south into northern Syria for decades, turning rivers into dust and making it harder for people to grow food and be self-sustainable. Turkey also built massive walls along its border, carving miles of scars through the region’s ancient forests. After decades of destructive colonial policies and war, the Internationalist Commune of Rojava, in cooperation with the Ecology Committee of the Cizire Canton, has begun taking direct action to protect the region’s autonomy. Out of the rubble of war-torn cities, the people of Rojava launched an ecological campaign to develop solutions to these problems and, as their campaign slogan proclaims, “Make Rojava Green Again”. The ecological campaign is addressing issues related to cultivation of food, reforesting large swaths of land, providing alternative forms of electricity, limiting fossil fuel usage, preserving the water supply, and even developing waste management solutions. Many of the local committee members are young adults who consider themselves responsible for building a more just social and economic system that functions in balance with the natural world. The women’s liberation movement in Rojava also plays an important role in operating ecological pilot projects, such as agricultural cooperatives. The Internationalist Commune is made up of individuals from around the world who have traveled to Rojava to support the revolution with their expertise, ideas, and labor. 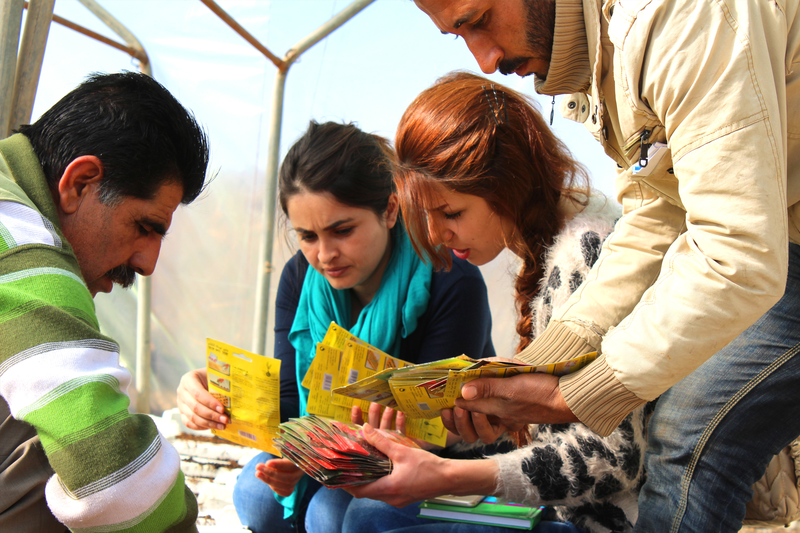 Internationals organizing with local communities in Rojava are working to support ecological projects, expand awareness, and build a healthy future across the region. The campaign is still very new and much work still lies ahead. 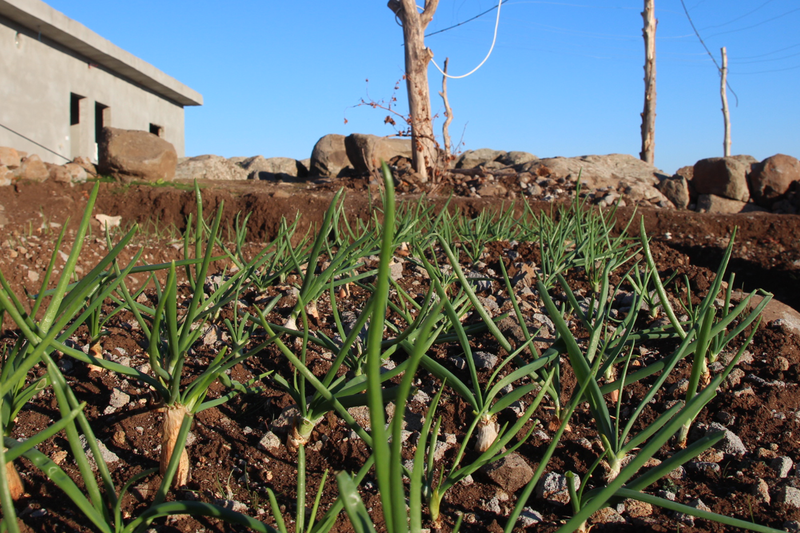 Developing urban agriculture is one tier in the ecological campaign to expand food security and autonomy in Rojava. Monocultures, the act of growing a single crop, has long been common policy supported by the Assad government, which has controlled Syria since 1971. Decades of monoculture resulted in the loss of ecological diversity across the region, and the use of artificially supplied water and chemical fertilizers has degraded the soil and made cultivation of food impossible in some areas. In Afrin, for example, the regime cut down ancient forests to grow monocultures of olive trees, degrading topsoil. The Internationalist Commune plans to create rooftop gardens and plant on undeveloped land within cities, which will further decentralize agriculture across Rojava. The return to traditional organic fertilizer-based agriculture is also a solution being put into practice by the Internationalist Commune. Over the last few decades, many wildlife and plant species in the region have been displaced by deforestation and monoculture practices. Many wolves, foxes, wild pigs, and birds found refuge in the Hayaka forest, one of the last forests near Derik in Cizire. In 2014, the democratic self-administration of Rojava declared the Hayaka forest a natural reserve in order to preserve the biodiversity of the region. Hunting, fishing, construction of buildings, and agriculture are prohibited within the reserve. 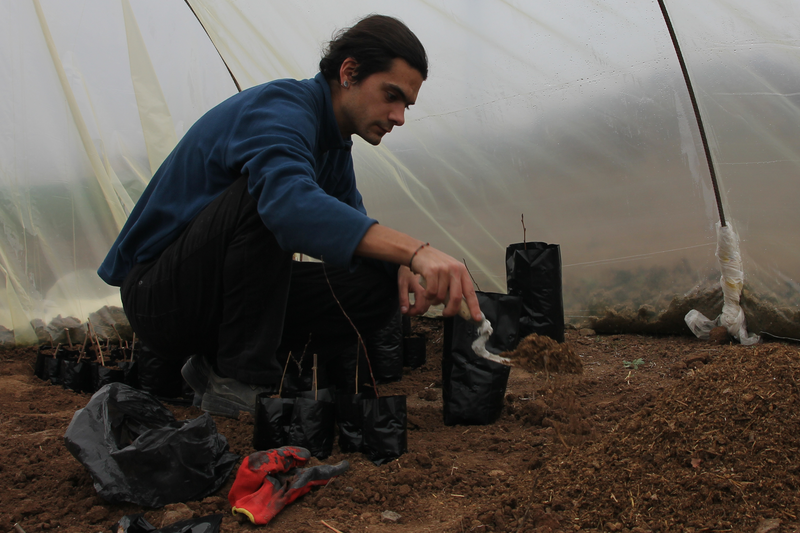 Since then, the development of non-profit cooperative tree nurseries has become an essential part of the ecological strategy to maintain autonomy in Rojava. Through the tree cooperative, internationalists will contribute their labor into reforesting Hayaka by planting 100,000 trees throughout the reserve, which will also improve local air quality. In the Spring of 2018, the Internationalist Commune will also plant 50,000 shoots of fruit trees that will produce pomegranate, grapes, pistachios, apricots, cherries, apples, pears, and olives. The commune will also plant wheat and cotton on the plains, establish beekeeping, and plant a variety of herbs accessible for medical research and use. Lack of access to clean water, and conflict over water sources, represent major factors in growing crises around the world. In Rojava, access to sustainable sources of water is yet another ecological issue the Internationalist Commune is working to overcome. The supply of clean drinking water mostly comes from springs and lakes. Climate change has contributed to the problem by shortening the rainy season across the region, which has decreased the amount of rainfall and significantly lowered groundwater levels. In the last two decades alone, precipitation in some areas has dropped 10-15%. Today, wells must be dug an estimated 50 meters deeper to access clean water. At the same time, Turkey has built dams upstream along the Euphrates and Xabur tributary, actively restricting the flow of water south into Rojava. In regions held by the Islamic State, Daesh has further compounded the problem of water scarcity by blocking off access to springs and wells. This lack of water has contributed to soil erosion and the dying off of once-thriving forests along river banks and lakes. Some of the remaining sources of water have also been left heavily contaminated after years of war across the region. Across the region, access to water for drinking and agriculture has been slowly reduced for decades, due to monoculture and the building of dams. In an effort to promote sustainable use of water for growing crops, the Agricultural Protection Committee has registered all water wells and prohibited further expansion of wells for agriculture. In addition, the committee has limited the planting of crops requiring irrigation to 60%. Plans have also been implemented to begin using greywater (water from showers, the kitchen, etc) and blackwater (from toilets) for organic fertilization of agriculture. Human waste is the largest source of nutrients available to improve the soil and increase agriculture from organic waste across the region (after long composting). Much of the research, and technical implementation, for various uses of recycled water are ongoing at the International Academy. Like most places around the world today, Rojava is still dependent on fossil fuels to drive vehicles, transport goods, and generate heat within stoves. Burning gasoline and diesel is the main source of air pollution in the region, especially in larger cities. The Internationalist Commune is currently developing plans to expand public transportation as a method to minimize this impact on the health of locals and environment. In addition, the ecological campaign is planting trees by thousands to help improve urban air quality. The supply of electrical power to many regions of Rojava is a primary hurdle in sustaining autonomous self-governance. Rojava currently derives electricity from three primary sources: hydro-electric power plants, natural gas, and diesel generators. Much of the electrical infrastructure, such as power lines and substations, has been destroyed after years of war across the region. Currently, the Internationalist Commune, with strong support from the Ministry of Energy, is developing plans to create a more decentralized and sustainable infrastructure. Currently, the development of the first wind power pilot project in Rojava has begun, which will serve as a working example for communities throughout the region. Volunteers are also working to create decentralized solar solutions, using photovoltaic technology, which will provide alternative sources of power and water heating systems. The Internationalist Commune believes this will reduce community dependency on both centralized electricity grids and fossil fuels. The Internationalist Commune in Rojava is simultaneously moving forward on plans for managing organic (food, paper, etc) and non-organic waste (plastic, metal, etc). Methods are being developed to sort, separate, and store all types of waste instead of burning or burying the waste, which causes air pollution and contamination of ground water. Organic waste is cleaned and stored for composting, and plans are underway to recycle all non-organic waste. Hazardous waste is stored far away from water sources to avoid contamination. Such a massive ecological overhaul within Rojava will not be accomplished overnight. One essential pillar in maintaining self-governance throughout the region is community education. Success for an ecological revolution in Rojava will come from sharing concrete experiences and skills at all levels of society. The Internationalist Academy will be the center of this effort and will train individuals in the principles of self-organization, women’s liberation, ecology, language, and culture. Students at the academy will participate in lectures and discussions at youth centers, municipalities, schools, and other institutions, to further develop what an ecological society in Rojava can look like and how to build it. 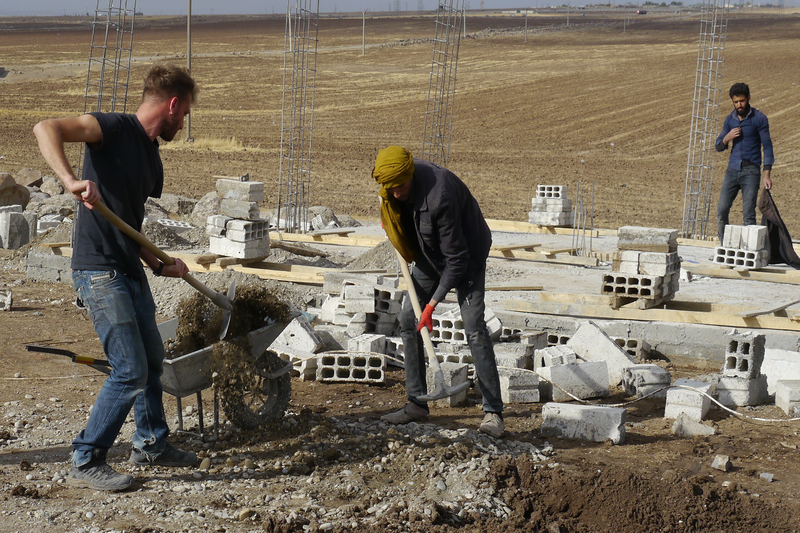 International volunteers skilled in sanitation, renewable energy, mechanical and electrical engineering, and even physicists, chemists, and biologists continue to travel to Rojava to assist the construction of an autonomous ecological society. The academy hopes to build awareness throughout the region to “overcome the ecological and social crisis” which they see is “brought about by capitalist modernity”, and promotes the destruction of nature and humanity. As Kurdish, Arabic, Syriac and international resistance fighters from all over the world deflect attacks by the the Islamic State and Turkish Armed Forces (TSK), the self-governed democratic society in Rojava is still very much under construction. Economic embargoes and war throughout the region continue to make it difficult to import the necessary technology, slowing the construction of a democratic ecological society in the region. Other hurdles include more common issues such as financial support and expertise. The ongoing ecological revolution behind the front lines is rooted in its commitment to the long-term health of both the natural world and people that live within it. While battles may be won against fascist armed forces encroaching from every direction, without a sustained push to build a healthy autonomous society back home, the revolution in Rojava will not maintain long-term sustainability.